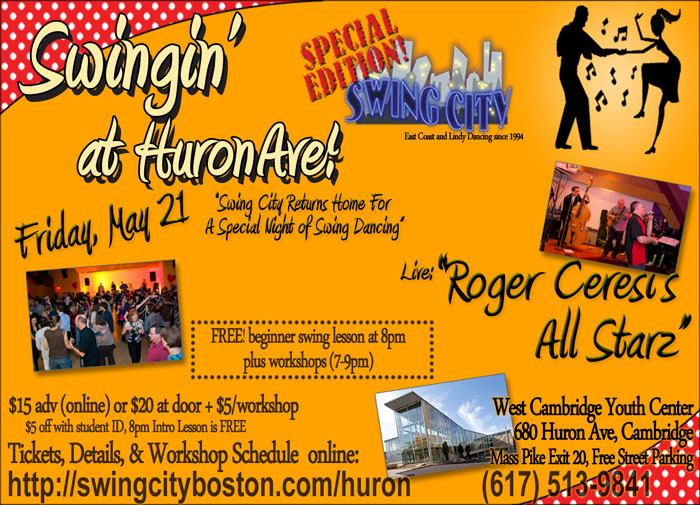 Featuring Live: "Roger Ceresi's All Starz"
Yes, folks, by special arrangement the City of Cambridge has granted us a another opportuinity to dance in the West Cambridge Youth Center, the brand spanking new building on the site of the old Swing City/VFW Post. We had a great time there for on several sold-out occasions now, and we've figured out the venue a bit. One thing is guaranteed: THE ORIGINAL SWING CITY VIBE! Instructors Tony and Aurelie of "Hop to the Beat" will be in the house as well, previewing their upcoming Beantown Camp, teaching workshops, and DJing the breaks for you. Be sure to check out their offerings! 9pm-1am Dancing with "Roger Ceresi's All Starz". Plus DJ's in the breaks. 7pm-9pm. We are offering three workshops ($5 each) and a beginner Swing Dance class (Free), taught by some of Boston's finest instructors. Complement your dancing skills with the basics of this close embrace style that can be danced at varying tempos. Instructors: Tony & Aurelie of "Hop to the Beat"
Learn the steps to this popular line dance choreography. Instructor: Mike Jonas, of "Step-Step-Triple-Step"
Never danced Swing before? This lesson starts at the beginning and takes you through what you'll need to get started, with plenty of humor and fun mixed in! In honor of the wonderful Swing Dance legend, Frankie Manning, fun moves he taught us! Student Discount: $5 off your total purchase with current, valid student ID. Ample street parking is available, as is the Fresh Pond public golf course lot across the street. Please observe all parking signs elsewhere in the neighborhood and exercise neighborly constrain by keeping noise to a minimum late at night. NOTE! We are NOT at the Somerville City Club this week. We will be returning there next week. No outside food or beverages please. NO ALCOHOL IS ALLOWED ON THE PREMISIS. PLEASE OBSERVE NEIGHBORLY QUIET BEHAVIOR LATE AT NIGHT. We'd like to be invited back.